For the song "Buddha's Delight", see Music and Lyrics: Music from the Motion Picture. Buddha's delight, often transliterated as Luóhàn zhāi, lo han jai, or lo hon jai, is a vegetarian dish well known in Chinese and Buddhist cuisine. It is sometimes also called Luóhàn cài (simplified Chinese: 罗汉菜; traditional Chinese: 羅漢菜). The dish is traditionally enjoyed by Buddhist monks who are vegetarians, but it has also grown in popularity throughout the world as a common dish available as a vegetarian option in Chinese restaurants. 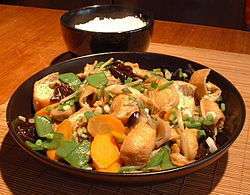 The dish consists of various vegetables and other vegetarian ingredients (sometimes with the addition of seafood or eggs), which are cooked in soy sauce-based liquid with other seasonings until tender. The specific ingredients used vary greatly both inside and outside Asia. In the name luóhàn zhāi, luóhàn – short for Ā luóhàn (simplified Chinese: 阿罗汉; traditional Chinese: 阿羅漢; pinyin: Ā LuóHàn) – is the Chinese transliteration of the Sanskrit arhat, meaning an enlightened, ascetic individual or the Buddha himself. Zhāi (simplified Chinese: 斋; traditional Chinese: 齋; pinyin: zhāi) means "vegetarian food" or "vegetarian diet." The dish is usually made with at least 10 ingredients, although more elaborate versions may comprise 18 or even 35 ingredients. If 18 ingredients are used, the dish is called Luóhàn quánzhāi (simplified: 罗汉全斋; traditional: 羅漢全齋). In China, Hong Kong and Toronto, when served exclusively using only the most flavor-packed vegetarian ingredients, such as pickled tofu or sweet bean curds, it is known as tián suān zhāi (simplified Chinese: 甜酸斋; traditional Chinese: 甜酸齋; pinyin: tian2 suan1 zhai1; literally "sweet and sour vegetarian dish"). As suggested by its name, it is a dish traditionally enjoyed by Buddhists, but it has also grown in popularity throughout the world as a common dish available in Chinese restaurants (though often not including all of the ingredients) as a vegetarian option. It is traditionally served in Chinese households on the first day of the Chinese New Year, stemming from the old Buddhist practice that one should maintain a vegetarian diet in the first five days of the new year, as a form of self-purification. Some of the rarer ingredients, such as fat choy and arrowhead, are generally only eaten at this time of year. The following is a list of ingredients often used in Buddha's delight, each of which, according to Chinese tradition, is ascribed a particular auspicious significance. As the dish varies from chef to chef and family to family, not every ingredient is always used in every version of the dish. 1 2 3 4 "Internet Archive Wayback Machine". Web.archive.org. 2008-02-10. Archived from the original on February 10, 2008. Retrieved 2012-08-22. 1 2 3 4 5 6 7 8 9 "Honolulu Star-Bulletin Features". Archives.starbulletin.com. Retrieved 2009-04-30. 1 2 3 4 5 6 7 8 Lin, Florence (1976). Florence Lin's Chinese Vegetarian Cookbook. Shambhala. p. 104. ISBN 978-0-87773-252-5. Retrieved 29 July 2013. 1 2 3 4 Young, Grace (5 May 1999). The Wisdom of the Chinese Kitchen: Classic Family Recipes for Celebration and Healing. Simon & Schuster. p. 126. ISBN 978-0-684-84739-9. Retrieved 29 July 2013. 1 2 "The Ginkgo Pages Forum - Blog: Jai a delight in the Chinese new year". Ginkgopages.blogspot.com. 2006-01-26. Retrieved 2009-04-30. 1 2 3 Hsiung, Deh-Ta; Simonds, Nina (1 June 2005). Food of China. Murdoch Books. p. 204. ISBN 978-1-74045-463-6. Retrieved 29 July 2013. ↑ "Buddha's Delight Recipe". Taste.com.au. Retrieved 2009-04-30. 1 2 Hsiung, Deh-Ta (19 February 2002). The Chinese Kitchen: A Book of Essential Ingredients with Over 200 Easy and Authentic Recipes. St. Martin's Press. p. 193. ISBN 978-0-312-28894-5. Retrieved 29 July 2013. 1 2 3 4 5 6 Hu, Shiu-Ying (2005). Food Plants of China. Chinese University Press. p. 1. ISBN 978-962-996-229-6. Retrieved 29 July 2013. ↑ "Buddha's Delight Recipe at". Epicurious.com. Retrieved 2009-04-30. ↑ Lin, Florence (1976). Florence Lin's Chinese Vegetarian Cookbook. Shambhala. p. 104. ISBN 978-0-87773-252-5. Retrieved 29 July 2013.